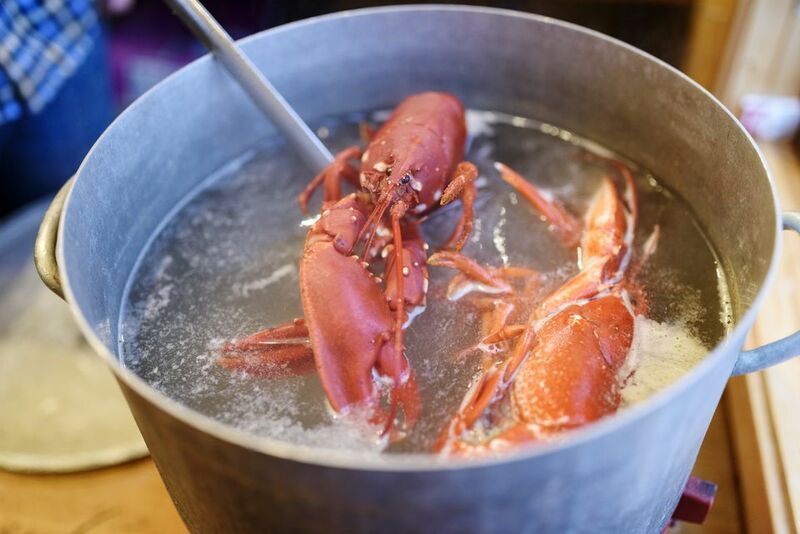 It isn't every day you get a chance to enjoy the richness of lobster meat, and with the critters being so expensive, every cook should have a recipe to make use of the leftover bodies and shells. Like many deep-sea creatures, lobsters are low in fat, but they are very high in cholesterol, with a whopping 212 milligrams. They're high in protein and vitamin B-12 also. It's usually the way we prepare lobster — with butter — that makes them a less-healthy option. But if you're looking for a special occasion meal, lobster is a delicious choice. Break the lobster shells into small pieces. Open the bodies and remove the gray, feathery gills, and the sand sac from between the eyes. Crush the bodies so they fit in a large stewpot. Heat the oil in the stewpot and sauté the onions, celery, and carrots over medium-high heat for 3 to 4 minutes. Add the lobster and cook for another 2 to 3 minutes. Add the garlic, fennel, and mushrooms, mix well and cook for another 2 to 3 minutes. Add the parsley, bay leaves, and tomatoes, then the wine or dry sherry. Mix well and cook until the alcohol largely burns off the wine, about 3 to 4 minutes. Add enough water to cover everything by 2 to 3 inches. Bring to a boil, then turn down to a simmer. Simmer gently for at least 90 minutes. Add salt to taste. Cook until it tastes full-flavored and then strain. Do this by turning off the heat, then grabbing all the big chunks with tongs and tossing them in the trash. Strain the rest through a fine-meshed sieve with a piece of cheesecloth set inside it. Pour into quart-sized mason jars or some other container. This will keep for up to 10 days in the fridge or 6 months in the freezer. There are a lot of ways to use your lobster stock (probably more than you think). One particularly decadent yet easy-to-make dish is lobster risotto. This traditional dish from Sardinia uses "leftover" lobster meat from the body as opposed to the claws and tail, which usually get eaten first.